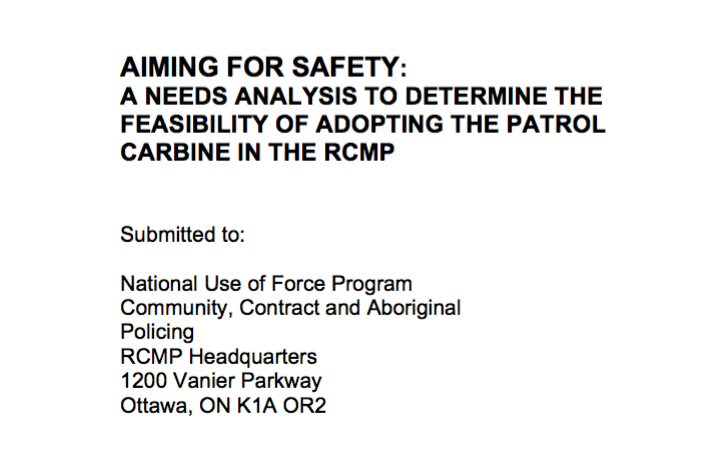 Here is a 2010 report that recommended the RCMP adopt the AR-15 rifle. The study and its author were in focus this week at a trial to decide if Canada’s federal police are guilty of having failed to provide appropriate equipment and training to officers responding to attackers. The case is relevant to all of us. The Royal Canadian Mounted Police were charged in 2015 with four violations of the Canada Labour Code after three officers were shot dead and two more were wounded by an attacker they were pursuing in Moncton, New Brunswick, in June 2014. The police pleaded “not guilty” last year, CBC News reported at the time. The trial began last week and is scheduled to last more than two months, CBC said this week. What do the charges and the trial mean for the rest of us? More than 100,000 Canadians are violently attacked, kidnapped, robbed, raped, threatened or killed each year, in part because our laws keep us disarmed and defenceless. Regardless of the court’s decision, our laws should allow all of us — police and private individuals — to equip ourselves with gear and training to stay safe and to stay alive. The RCMP were still researching whether to use self-loading rifles in 2010 (and later). Today, some people think having a semi-automatic rifle in every cruiser is a no-brainer, while others oppose what they view as the militarization of police. Deciding on gear involves much more than the gear, and must consider other gear, tactics, training, and more. What sights, magazines, ammunition and slings to use? Add rifle to sidearm and shotgun, or replace shotgun with rifle? How to store guns in cars? How to adapt individual and team protocols? How to train instructors, and almost 12,000 constables? How will officers respond to the changes? What about the public? How can we pay for it? Plus a thousand other questions. The report surveyed officers about weapons, tactics and other topics. The results reveal officer opinions, and point to considerations for managers. The report, dated March 2010, was prepared by Darryl Davies, a professor at Carleton University in Ottawa who spoke to the court this week. Other researchers who recommended rifles also testified. Davies said in court this week that the RCMP later changed its opinion, CBC News reported. The author was paid $80,000 for his work, CBC said. Consider how long it takes to adopt the rifle: The RCMP, which decided in 2011 to use a semi-auto version of Colt Canada’s C8 rifle, tweeted in February 2016 that they had trained more than 25 percent of front-line officers in its use and aimed to have 50 percent trained by April this year. The best real-time updates from the trial that I’ve found are tweets by the CBC’s Gabrielle Fahmy. Her latest report, published today, is here. Note the CBC’s language in describing AR-15s. In its coverage of the trial, CBC refers to them as “carbines” and “patrol carbines.” In other coverage, it has referred to them as “assault rifles,” “assault weapons,” and “military-style assault rifles.” Examples here, here and here. RCMP’s Independent Review – Moncton Shooting – June 4, 2014. Details what happened. I can’t read it without crying. The Patrol Rifle: Considerations for Adoption and Use, by the International Association of Police Chiefs, 2007.